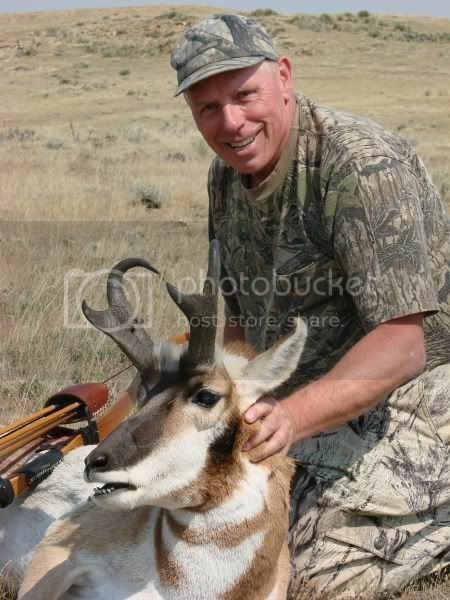 I shot this buck on the last day of my Wyoming antelope hunt. I used a 50# Great Northern Ghost and a 650 gr. larch arrow. I am looking foward to going back in a couple of years. ALLRIGHT Jack, Way to Go. you done good Sir Jack! you are H#!! on them speed goats. how long are those horns? Rob I didn't get a chance to measure the horns. We had to hurry to the processer to get it cut and frozen before the trip home. I think he will go in the mid 60's just under the P&Y min. but the long cutters and deep hooks may fool me. regardless he is one fine looking goat. i wouldn't have even thought about shooting. you are the goat man. did Bob get a shot, how did the rest of the guys do? sounds like you got him at the eleventh hour..... you got my mouth watering for some pronghorn steaks. fyi. did you see the Fulfillment farms hunt posted by David Stein? it's the last full week of October. you should come on down and join the rest of the Trad Gang group. shoot me a PM if you might be interested. Congratulations Jack! Nice to see your fall seasons off to a great start. Keep it up! Way to go Jack. I am way jealous. The picture says it all. Looks like i need to take you up on an 08 Hunt when i return to the states. i think we should all slip into Jack's back pocket next year.